Rutherford Renewables provided independent capability in the initiation, planning and delivery of Biodigestion Projects for the recycling of organics to biofertiliser and renewable energy. Rutherford Renewables provided particular expertise in the use of the biofertiliser to farmland including technical, commercial and marketing. The biodigestion process which is also known as anaerobic digestion in biogas digesters provides renewable energy, for which another word is alternative energy. One of the least utilised forms of energy supply is via CHP (Combined Heat and Power) this is one of the most sustainable types of green power which can be used because it is the low grade heat , and the product of power generation. CHP can be used for space heating in buildings, for heating greenhouses and the farmhouses and barns of the farms which have biogas plants. Biodigesters can be used to reduce pollution as the example project shown in our "Projects" section in Scotland demonstrated. Biodigestion can be an ethical and environmentally friendly way to reduce carbon dioxide, thus helping in the struggle to minimise climate change, which is leading to global warming. The simplest way to use the biogas produced has been to generate electricity. Once again people give this electricity a variety of names, such as "green electricity", and "organic electricity". This is ecofriendly electricity leading some to call it "ecopower". 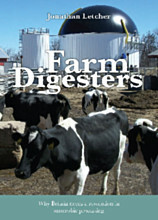 Although the use of the anaerobic digestion process to produce biogas also helps to slow-down, or halt soil depletion. As stated above it can reduce water pollution, helping to maintain a healthy ecology supporting an abundance of fish, and marine life. Unfortunately, small on-farm biogas adoption has been remarkably slow, so the benefits available are not yet being realised. In other areas of waste management biowaste, such as household food waste, restaurant waste, catering waste, food retail waste, and food processing waste, is increasingly being sent to food waste anaerobic digestion facilities. The reason of growth in food waste anaerobic digestion, and the main driver here, is the introduction of regulations requiring the source separation of waste to allow this waste to be collected and taken to food waste biogas plants.